Boy was it hard to part with this one. I may have to make another for myself. 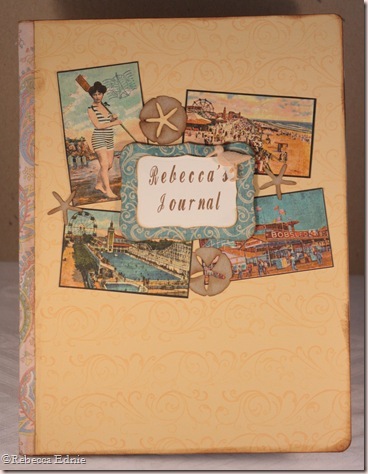 I joined a very long intensive swap called “Theme a Day Journal”. The swap assigned 30 questions or topics for you to answer. Anything from your 10 favourite people and why to your bucket list to your goals for this year and where you expect to be in 10 years. Very soul searching! So I finally finished it and realized I had a huge chunk of all the things I care about in there. SO I asked hubby to copy it for me so we have it somewhere. I hope my kids enjoy it in 20 years or so because they are in there a LOT! In addition to the journaling, it was recommended to doodle on or decorate the pages and a requirement to decorate the front and back covers. The back cover has the same stamped cardstock as the front but nothing else. The binding is covered in a fabric self-adhesive tape I’ve had for ages. To my mind, it doesn’t really match but it was all I had. I later found out that many people just cover it in CS. Why didn’t I think of that? Minus the binding, I adore how this turned out. I am CRAZY about the seaside, not a dumb old lake but the OCEAN. Shame I live thousands of miles away. If you’d like read the topics or complete a similar journal, you can see all of the topics here http://www.swap-bot.com/swap/show/60624. I really found it thought provoking. Even if you don’t journal all of them or any in fact, it still makes you think and can even bring some perspective to a busy schedule.